This was brought about to balance the extremely high budgets that the studio system worked with and more power to them. In a world where we are inundated with the studio fare it is refreshing beyond words to watch this powerful film. The only other Dogme 95 film I have seen thus far was Open Hearts by Susanne Bier and it was superb. Story and character are of key importance and consequently we get a newer, purer form of cinema and story-telling. 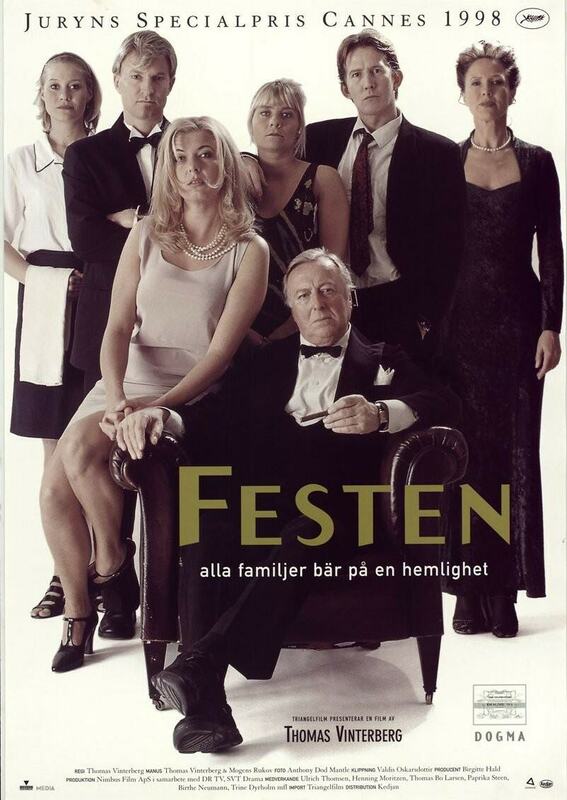 Here, Henning Moritzen plays Helge, the father who has invited his extended family to his hotel/castle to celebrate his 60th birthday but as the dinner/festivities proceed deep, dark secrets come to the surface and turn the celebration into something quite unforeseen. His children gather and try to come to terms with the death of their sister. Michael, played by Ulrich Thomsen-who was excellent in Brodre, Susanne Bier’s film that was remade, not nearly as well though, by Jim Sheridan, Christian (Thomas Bo Larsen-Pusher/The Hunt) and Helene (Paprika Steen-Open Hearts) are all excellent, breathing life into the functional dysfunction of the family unit. Birthe Neumann plays Helge’s wife Else with all the dignity and stature of a woman in this position. As you know by now, I rarely talk too much about the plot, not wanting to spoil your enjoyment but suffice to say this is a film about families, secrets and lies and does not shy away from letting you really experience a family at a crucial juncture in it’s journey. There are a plethora of Danish films have been made of late that push the envelope of what can be done with cinema (Reconstruction, Dogville, The Five Obstructions, The Hunt etc etc). Families, eh? What ya gonna do? Anybody have any Dogme 95 recommendations?